Once a colonial house, Hotel Del Peregrino has been completely remodeled in the traditional Yucatan style, featuring high ceilings and restored mosaic tiles. All of our lovely rooms come with mini-split air conditioning, ceiling fan, 21” cable television, free WIFI, security box, off-site swimming pool, guest computer, relaxing four person Jacuzzi located on our beautiful terrace and much more. 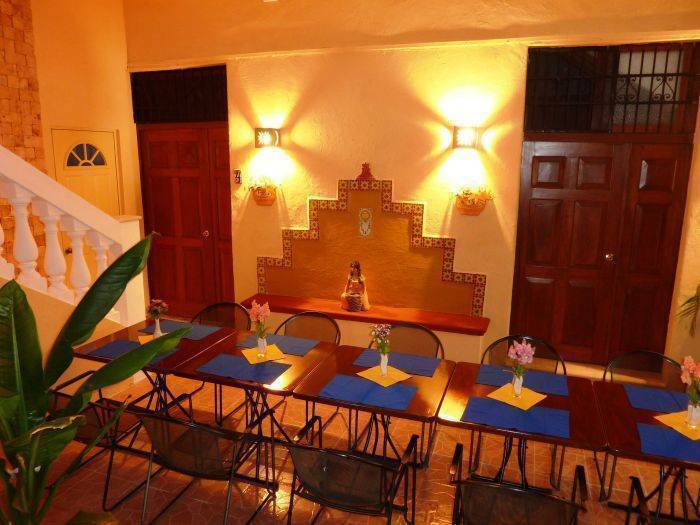 Centrally located in the historic district of Merida, Mexico, this colonial hotel is near a variety of interesting attractions and offers convenient services for a comfortable holiday. There is parking and the neighbourhood is quiet. Hotel Del Peregrino is just steps from city attractions such as La Plaza Grande, the Governor's Palace and the Saint Idelfonso Cathedral. The hotel’s own travel agency can help arrange tours to nearby archaeological sites and cities. Before exploring the area, guests can enjoy a complimentary buffet breakfast on our central patio. Guests can also take advantage of the hotel's available kitchen to prepare lunch or dinner, and then enjoy a refreshing drink in the Palapa Bar. At Hotel del Peregrino we have a long standing reputation for amazing service and cleanliness. These are qualities we strive to maintain and always improve. Hotel del Peregrino is located in the Historical Center of Merida, Yucatan it is walking distance to all the attractions in town, including La Plaza Grande, Governor’s Palace, Saint Idelfonso Cathedral and Paseo de Montejo. There is parking and the neighbourhood is quiet. We also have our own travel agency where you can book tours to visit the surrounding area, including Chichen Itza, Izamal, Progreso, Dzibilchaltun, Uxmal, Celestun, cenotes and much more. Or if you want to do it on your own, we can arrange for your car rental and help you with directions. 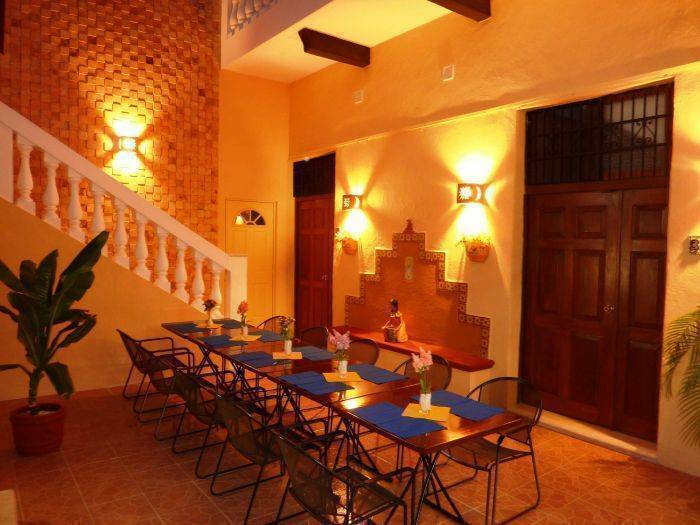 Step into Hotel del Peregrino, and instantly feel the cool, clean atmosphere of our colonial home. Starting with the lobby, in Hotel del Peregrino every room has beautifully restored mosaic tiles in the traditional Yucatan style. Tall ceilings add to the spaciousness, inviting you to relax! All our rooms are comfortable and secure with twin and full size beds, private baths, cable television and safety deposit boxes. Breakfast is included in our rates, and you can enjoy it on our central patio before going out for your next adventure. Also included in the price of your room are free internet and wireless access and the use of our beautifully decorated kitchen to prepare your own lunch or dinner. Upstairs on the Terrace is the Palapa Bar. It's a place for you and your friends to relax in the evening, have a drink, talk about the day’s events, and plan for tomorrow. All our rooms are comfortable and secure with twin and full size beds, private baths, mini split air conditioning, cable television and safety deposit boxes. 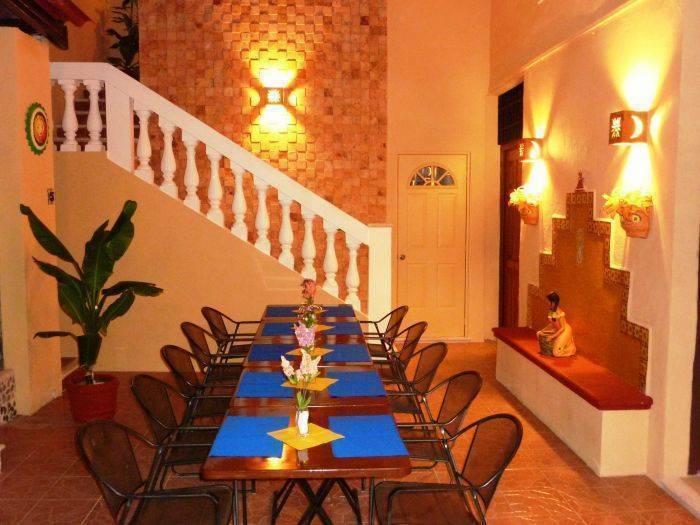 Prices are based on double occupancy - $10 USD per extra person.